The United States has probably never been more engaged in the Middle East than now, with an American army of occupation in Iraq and President Bush promoting a Israeli-Palestinian road map to peace. Yet the Bush administration has virtually ignored Syria, which physically links Iraq and Israel, except to single it out as a target of occasional bellicose threats. There has been no question of constructive engagement with Iraq’s most powerful Arab neighbor. Instead Syria is seen merely as an unofficial adjunct to the Axis of Evil, ripe for reform if not outright invasion. That’s unfortunate, because Syria, despite its many justifiably condemned policies, stands out in the Middle East in one respect that American policy makers should take into consideration. 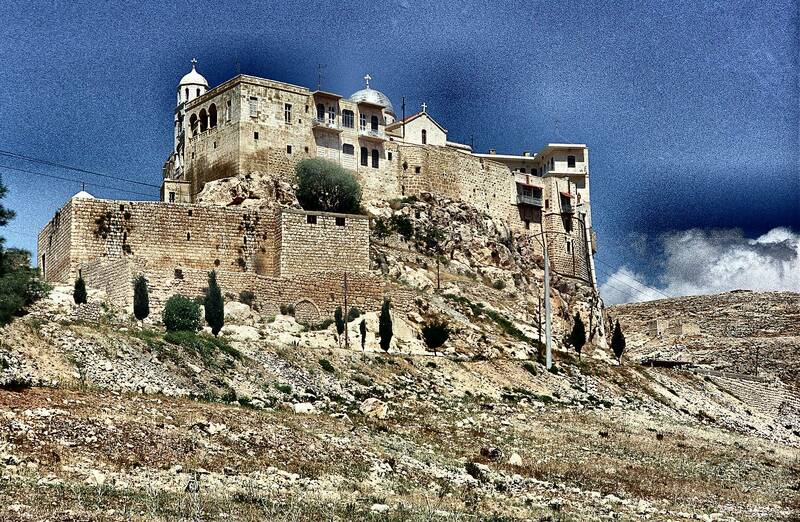 This aspect of Syria is most starkly on display at Saidnaya, a large Orthodox monastery north of Damascus. The monastery sits on a great crag of rock overlooking the olive groves of the Damascene plain, more like a Crusader castle than a place of worship. But what is most striking about Saidnaya is that on any given night, Muslim pilgrims far outnumber Christian ones. When you walk into its ancient pilgrimage church, you find the congregation consists largely of heavily bearded Muslim men and their shrouded wives. As the priest circles the altar, filling the sanctuary with clouds of incense, the men bob up and down on their prayer mats. A few of the women approach the icons. They kiss them, then light a candle. The religious pluralism that the pilgrimage church represents was once not uncommon across the Levant. Throughout the region until very recently, villagers of all faiths would converge on the shrines of Christian saints to ask for children and good harvests. Eastern Christians and Muslims lived side by side for nearly one and a half millennia because of a degree of mutual tolerance and shared customs unimaginable in the solidly Christian West. From Bosnia to Egypt, Christians and Muslims as well as many other religious minorities managed to live together. If that coexistence was not always harmonious, it was at least — with a few notable exceptions — until the beginning of the 20th century, a kind of pluralist equilibrium. Only in the last 100 years has that pluralism been replaced by a new hardening in attitudes. Across the former Ottoman dominions, the 20th century saw the bloody unraveling of that complex tapestry — most recently in Kosovo and Bosnia, but before that in Cyprus, Palestine, Greece and Turkey. In each of these places pluralism has been replaced by a savage polarization. In dribs and drabs, and sometimes in great tragic exoduses, religious minorities have fled to places where they can be majorities, and those too few for that have fled the region altogether. Only in Syria has this process been firmly arrested: there alone, you still find five or six religious sects coexisting in villages across the country. Since the coalition’s victory in Iraq, Syria has frequently been given notice that it could well be the next target of American wrath. Yet the Middle East is not a place where the simplistic notion of good guys and bad guys makes much sense. It is a place of murky moral gray, not black and white. Torture, repression of minorities, the imposition of military law and the abuse of basic human rights happen every bit as frequently and as unpleasantly in states that are American allies as they do in states that are not. Certainly, most would agree that Syria has much to reform. It is a one-party state where political activists are suppressed and the secret police fill jail cells with political prisoners who will never come before a judge. Violent opposition to the regime is met with overwhelming force, most horribly in the case of the armed rising of the Muslim Brotherhood in Hama in 1982: the city was sealed off and at least 10,000 people were killed. Yet the balance sheet is not entirely one-sided, and with the Pentagon busy drawing up invasion plans even as Iraq still contends with postwar anarchy and the Taliban resurfaces in southern Afghanistan, it is well to consider carefully exactly what would be lost if Syria’s president, Bashar al-Assad, were to be deposed. For if Syria is a one-party police state, it is a police state that tends to leave its citizens alone as long as they keep out of politics. And if political freedoms have always been severely and often brutally restricted, Mr. Assad’s regime does allow the Syrian people cultural and religious freedoms. Today, these give Syria’s minorities a security and stability far greater than their counterparts anywhere else in the region. This is particularly true of Syria’s ancient Christian communities. He added: ”If Syria were not here, we would be finished. It is a place of sanctuary, a haven for all the Christians: for the Nestorians driven out of Iraq, the Syrian Orthodox and the Armenians driven out of Turkey, even the Palestinian Christians driven out by the Israelis” in 1948. The confidence of the Christians in Syria is something you can’t help but notice the minute you arrive in the country. This is particularly so if you arrive from eastern Turkey. There, until very recently, minority languages like the Aramaic spoken by Syrian Orthodox Christians were banned from the airwaves and from schools. For Christianity in eastern Turkey is a secretive affair, and the government has closed all the country’s seminaries. But cross into Syria and you find a very different picture. Qamishli, the first town on the Syrian side of the frontier, is 75 percent Christian, and icons of Christ and images of his mother fill shops and decorate every other car window — an extraordinary display after the furtiveness of Christianity in Turkey. The reason for this is not hard to find. President Assad is Alawite, a Muslim minority regarded by orthodox Sunni Muslims as heretical and disparagingly referred to as ”little Christians”: indeed some scholars believe their liturgy to be partly Christian in origin. Mr. Assad’s father, Hafez, who was president from 1971 until his death in 2000, kept himself in power by forming what was in effect a coalition of Syria’s religious minorities through which he was able to counterbalance the weight of the Sunni majority. In the Assads’ Syria, Christians have done particularly well: in his final years, five of Hafez’s seven closest advisers were Christians. The Christians are openly fearful that if the Assad regime should fall, their last real haven in the Middle East will disappear and be replaced by yet another fundamentalist government, as may be the case in Iraq. All this does not excuse the repressive policies of the Assad regime. But in a region where repression is the rule rather than the exception, it is important to remember that the political rights and wrongs are rather more complex than the neoconservatives and Pentagon hawks are prepared to acknowledge — or perhaps even know.